So here we collected all the major internet packages of all 5 mobile telecom companies; Ufone, Zong, Mobilink, Telenor and Warid. Here, we presented internet packages in the tabular form for easy comparison and understanding of our readers. 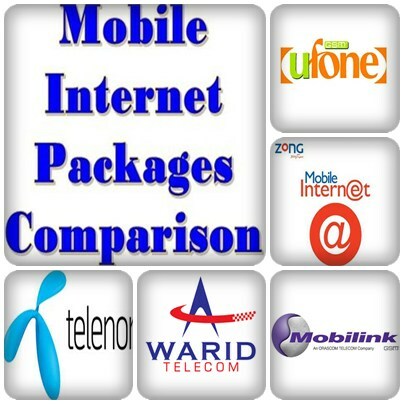 Packages are mainly divided in four categories; Daily, Weekly, Monthly and Data Base Packages. 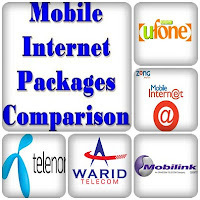 And then these packages are compared for charges, data volume limit and validity, So you can easily find and select the internet package which best suits to your needs. We tried to cover and enlist most of the packages but still there are soem internet packages which may not be found above. We also tried our best to give correct information and honest comparison however if you find anything wrong please give correct information in comments. Note: Telecom companies may change or end any internet package. Whcih internet package you are using and how is your experience your internet package? What is good and what is bad with your package? And are you satisfied with your mobile company's package and services?